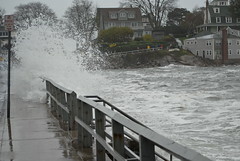 Superstorm Sandy has hit Southeastern Connecticut harder than we’ve been struck in over fifty years. While we clean up the limbs and fallen trees, rake up the debris from our yards, and pray that our spring bulbs are ok under the ground, you may be wondering, “what can I do to prepare my property from the next storm?” Well, we at Algiere’s Landscaping are glad you asked! The first thing is to look around your property and put away anything that might be blown around. Not just the obvious things like the grills and the lawn chairs. Really look at your yard; do you have a dog house? Swings? Birdhouses? Put it all away, anything you can lift and carry, a 75 mph wind can pick up and put through your window. Next, take a walk and take stock of your trees. Are there any dead limbs that should be removed? Any trees that appear to be in questionable health? Even if they didn’t come down this time around, it doesn’t mean that Sandy didn’t weaken it to the point that it’s a risk for next hurricane season. Pay the most attention to those trees closest to your house, garage, and any outbuildings you might have. If the forecast is for a particularly cold storm, like a blizzard, you might want to consider digging your spring bulbs back up, especially the dahlias and gladiolas. Either way, protect your delicate perennials with some extra mulch before the snow and ice cover them over. This entry was posted in Uncategorized and tagged Atmospheric Sciences, Benjamin Franklin, blizzard, blizzards, Bulb, Earth Sciences, Garden, gardening, gardens, Home, Home garden, home improvement, hurricane, hurricanes, landscaping, nature, Norwich, prevention, protection, Sandy, severe weather, snow storms, Stop & Shop, Superstorm Sandy, Tree, United States, weather, yardwork on November 2, 2012 by mspetersonexplains.